This panel of file photos show U.S. Rep. Bruce Poliquin in 2017, left, and state Rep. Jared Golden in 2018, right, in Maine. Golden will challenge Poliquin for the 2nd District Congressional seat in the November 2018 general election. 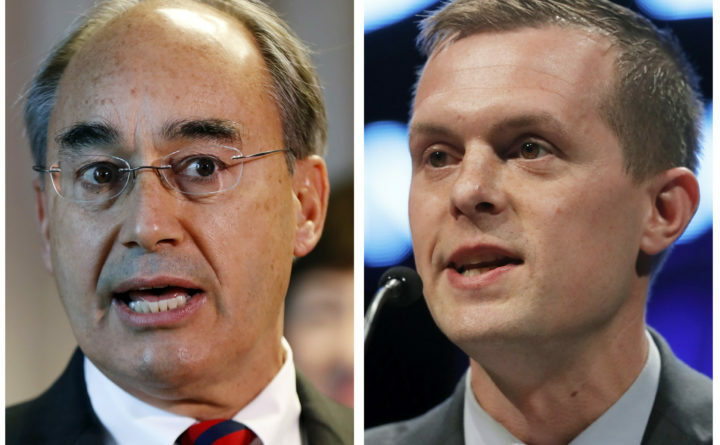 As candidates vying for Maine’s 2nd Congressional District seat gear up for their last televised debate, let’s unpack some of the points made during the first debate a week ago between two-term incumbent U.S. Rep. Bruce Poliquin and his Democratic challenger, Jared Golden. Maine’s 2nd District, one of the most rural in the country, stretches between the state’s eastern, western and northern borders, encompassing parts or all of 11 of the state’s 16 counties. Voter registration in the district has tilted toward the GOP in the four years since Poliquin won the seat in 2014. In 2016, the district gave its electoral vote to President Donald Trump in a historic split from the rest of the state. Since Trump was elected, Poliquin has voted with the president’s position 97 percent of the time, according to FiveThirtyEight. Tapping the district’s rightward shift and the advantages incumbency offers, Poliquin has sought to portray Golden as culturally and politically out of touch with the district’s hardscrabble, majority working-class electorate that tends to value independence more than party allegiance. Golden, a Lewiston native and Marine Corps veteran, has campaigned as pragmatic more than partisan, and as someone whose working-class roots contrast with Poliquin’s wealth-building in the financial sector. In ads and during the first debate, each tried to portray his partisan opponent as extreme. Let’s sort through that campaign clatter on three key issues. Poliquin accused Golden during the Oct. 8 debate of conspiring to take away Mainers’ 2nd Amendment rights, and he touted endorsements from the National Rifle Association, the Gun Owners of Maine and the Sportsman’s Alliance of Maine, against Golden’s low or failing scores. Since he was elected, the 64-year-old hasn’t voted for any restrictions on firearms. Last year, he supported a bill to make concealed-carry permits valid across state lines. Golden voted against a similar bill in the Maine Legislature. Poliquin also voted to ensure that any veteran deemed mentally competent be able to purchase a firearm and to reverse a rule enacted under former President Barack Obama in order to make it easier for someone with a disability to buy guns. Golden, who was deployed to Iraq and Afghanistan during his four years in the Marines, has campaigned as a 2nd Amendment advocate, pointing to legislative votes that supported what he calls “common sense public policy and safety” measures. In 2015, Golden co-sponsored a bill later passed into law that allows Mainers to carry a concealed weapon without a permit, but he ended up voting against the final version of the bill after it was amended. The 36-year-old later voted against implementing a statewide registry that would’ve required gun owners to register their firearms. Golden has voted in favor of allowing the use of silencers on hunting rifles. He thinks bump stocks should be banned but that AR-15’s shouldn’t be. Policy decisions that have earned Golden condemnation from organizations like Gun Owners of Maine and the National Rifle Association — which throws its support almost solely behind Republican candidates, including Poliquin — include making it illegal to knowingly sell a gun to a convicted felon. Earlier this year, he also supported a bill vetoed by Republican Gov. Paul LePage that would’ve prevented high-risk people, including domestic abusers — or someone who is the subject of a protection from abuse or restraining order — from purchasing or possessing any firearms for a court-ordered period of time. Last year, the 2nd District unemployment rate hit 4.5 percent, compared with the rest of the state’s average 3.9 percent, according to U.S. Census Bureau data. The median income in the mostly rural, aging district has historically lagged behind Maine’s 1st Congressional District, which includes Portland and southern coastal communities. The disparity in median household income gaps between districts year to year tends to hover around $20,000. Last year, the median income in the 2nd District was just more than $63,000, compared with nearly $85,000 in the 1st District. Touting it as a job creation tool, Poliquin supported the Republican tax overhaul late last year, which aims to reduce tax burdens on middle-class families. Critics of the bill argued that it was just a way to lower corporate taxes and that it has failed to translate to higher wages for most workers. Poliquin pointed to his bipartisan role in helping to secure — alongside U.S. Sens. Angus King and Susan Collins — the $17.3 million Department of Defense contract at the New Balance manufacturing plants in Maine, as part of a government requirement that all military personnel have American-made uniforms and equipment as evidence of his role in the state’s job growth. But that federal requirement derives from a footwear-specific revision of the Berry Amendment, which Poliquin’s predecessor, Democrat Mike Michaud, introduced. Poliquin joined Democrats two years ago in fighting off an effort by Republican House members to gut the Berry Amendment. Golden said his approach to bolstering the district’s economy would be through urging the formation of more unions as a means of increasing wages, and by helping the government foot the bill for more infrastructural investments that small businesses owners can use to help build their companies, such as broadband and renewable energy. “Our job is to make the investments businesses can’t,” Golden said. Golden countered that Poliquin tried to strip Mainers of their access to affordable health care when he voted to repeal the Affordable Care Act. Both have dismissed these claims as lies. Golden voted for the state’s Medicaid expansion — which remains in limbo because of legal and State House stalemates — and moving toward a universal health care system. He also wants to drop the age to qualify for Medicare to 55, to allow customers paying high health premiums to, instead, buy into Medicare. In general, Golden believes government must fill the gaps in coverage that exist in the current system, which mixes private insurance plans with government coverage for disabled and elderly people. Poliquin generally embraces market-based health care plans, and he argues that a private sector approach to widen the competition pool allows patients to shop around to find the most affordable rate for them. He and other Republicans tried to replace it with the American Health Care Act. Though the party’s effort ultimately failed in the Senate, it would have allowed states to drop certain safeguards for people with pre-existing conditions, a pivot from the ACA, which protects those patients, in part, by preventing insurers from charging them more. The repeal bill that Poliquin voted for was written in a way that appeared to protect people with pre-existing conditions. But health policy experts contested that it would have allowed insurers to raise rates in other ways to make coverage unaffordable for those people, many of whom live in the 2nd District. More than 56,000 Mainers would have lost affordable insurance coverage and by 2022 under the AHCA, according to an Urban Institute study. The final debate, which also includes independents Tiffany Bond and Will Hoar, will be aired at 7 p.m. Tuesday on WAGM, the CBS and Fox affiliate in Presque Isle, and WMTW, the ABC affiliate in the Portland market.